OTTAWA – “Tobacco is a product that does a lot of damage. 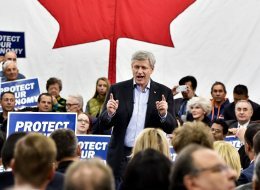 Marijuana is infinitely worse and it’s something that we do not want to encourage.” — Conservative Leader Stephen Harper. Canadians have one of the highest rates of cannabis use in the world, and a relaxation of marijuana laws is now an election issue. It’s a path Conservative Leader Stephen Harper vehemently opposes, using it to drive a wedge between him and Liberal Leader Justin Trudeau, who wants to legalize marijuana. After Harper clashed with Trudeau over the issue last week, the prime minister was asked Saturday why he was so opposed. “There’s just overwhelming and growing scientific and medical evidence about the bad, long-term effects of marijuana. We’ve spent a couple of generations trying to reduce the usage of tobacco in Canada with a lot of success,” Harper said. So, is cannabis “infinitely worse” than tobacco? Marijuana does carry health risks and there is growing medical evidence about long-term health effects, but there is “a lot of baloney” when it comes to marijuana being “infinitely worse” than tobacco. Let’s sort through the haze. While there is about 20 years’ worth of research on the health effects of marijuana, the science is still evolving about how the level of usage and the potency of strains affect health. A report from the Centre for Mental Health and Addiction in Toronto, citing multiple research studies, said that daily or near-daily use of marijuana can affect cognitive and psychomotor functioning by slowing down how quickly one thinks and acts. The report also ties regular, long-term cannabis smoking to respiratory problems with links to bronchitis and cancer. Frequent marijuana use could also exacerbate pre-existing mental health issues, although that link is not well understood. There are also concerns about addiction. About one in every 10 cannabis users risks becoming dependent. The rate for tobacco users is much higher at 68 per cent. Each year, about 37,000 Canadians die as a result of smoking tobacco. Tobacco use costs the health care system an estimated $4.4 billion. The Canadian Cancer Society says that tobacco smoke contains more than 4,000 chemicals, with more than 70 per cent of those chemicals being carcinogens. Among the four leading causes of death in Canada — cancer, heart disease, stroke and lung disease — smoking tobacco is a main risk factor. The society says that smoking tobacco is estimated to be responsible for almost one-third of all cancer deaths, and 85 per cent of all lung cancer cases. Research has shown that about four per cent of marijuana users report some sort of health, legal or financial trouble, said David Hammond, the CIHR Applied Chair in Public Health at the University of Waterloo. The amount for tobacco is higher: anywhere between 30 and 50 per cent, Hammond said, suggesting that tobacco use carries more health concerns than marijuana use. Research has also shown these teens may have a genetic predisposition to developing mental health disorders, he said, blurring links between smoking marijuana and mental health issues. As well, a chemical in marijuana, known as CBD, has been shown to be an anti-psychotic that counteracts THC, Laviolette said, creating a debate with more subtleties than political sound bites allow. The Canadian Cancer Society says research linking marijuana smoking to increased cancer risks “is not as strong or comprehensive as the evidence that links tobacco use and cancer.” Part of the problem is that marijuana smokers also use tobacco and sometimes mix the two substances. With mental health issues, the science isn’t conclusive because marijuana use may exacerbate underlying issues. “We certainly know enough to know that there are important risks,” Hammond said. Marijuana does carry some health concerns — of that there is little debate. Saying it is “infinitely worse” than tobacco is “a lot of baloney” on the CP scale. The data on marijuana use and the links to health appear to be focused on heavy use of high-potency strains by teenagers and pregnant women, with fewer side effects found in casual, adult marijuana users.